Does anyone know an alternative to artchie userdialogs? It is impossible to use this library with owners attitude and he closing issues simply and now blocked commenting on issues. I checked this plugin in github and didn't find any information about that author doesn't allow us to use it . What makes you think that ? where are you reading i am saying that he doesnt allow us to use. he doest allow us to comment in issues if he doesnt like the issue and i dont know if only me but i cant comment on any issue now. ok, he is pretty annoying. you can see in the issue and in many other issues, he keeps deleting comments. I get notifications sometimes and when i click, i can see that my comment was deleted. I personally never write a comment on github without testing or experiencing something. i pay attention that my comment is valuable. This is very disrespectful. I dont know what is wrong with commenting for me. either you are contributor and he allowed only contributors to comment now or he blocked me. if he blocked me, i dont know any reason until today. only reason probably could be that i liked one of comment, he had argument with a German guy. you can find those threads below. this is one of the most encountered issue in this package and 3 people created issue. he either block people or their issues who ever opens issue about this problem. He claims always that he has no time. he has no obligation to give free support. thats why it is open source etc. but he blocks people, issues or delete their comments who wants to contribute. for those reasons, i decided i cannot continue with that package and i decided either to find an alternative or create one myself. @batmaci I'm the "annoying guy" you are referring to. If you're wondering why you were removed, it is simply because of threads like this and this isn't the first time you've taken a shot at me. You act entitled and think OSS owes you or something. In all of the issues you bring up, I answered all of the them, they just didn't like the answer and decided to argue back. I'm not going to debate once I've given an answer - they can contribute back a fix that they feel is appropriate if they want. As for the support, I don't have to give any. No OSS maintainer does especially when the code is free. In my case, I made the libraries because I needed it for something and it was fun. In closing, I have done almost 50 libraries over the last few years that total over 2 million downloads. I still add fixes, features, & give support where applicable almost daily. I ask for literally nothing, but for people to be respectful. What have you done for OSS that allows you to speak poorly of people? @AllanRitchie I attacked you after you blocked me not before. if you prove this that i deserved to get blocked with any bad language or even a stupid comment to waste your time, i will donate you whatever you need. only reason you blocked me that i gave a thumbs up to a comment saying "relax" to you. You cant even bare to that, seriously? you just block people telling you relax, while you use them any language you want. when i open an issue or write comment, i will search an answer for it all over at least hours even days and if i am only desperate find a solution, i will do that. So why are you deleting my comment and others' and you are the one also wasting our time? we get notifications for issues where we have deleted comments. did you even think about from our aspect that you waste also our time. "But I see, you have a very different opinion on OSS. I did not request any support or anything like this. I just reported an issue that is there and thats exactly the reason for a issue section on Github." @batmaci You are still missing the point. You shouldn't be personally attacking anyone's work or person at all... especially when the work is free. I didn't ask you to use it and therefore, I haven't wasted anyones time. It is my code, my time, my rules. I've helped a lot of people and I've failed a bunch of people, but in the end - I made something that obviously provided value to some and asked for nothing in return. I will continue to try and make better stuff going forward regardless of people like you, so continue to attack if it makes you feel better. I'd be careful of being moderated though. You will remain blocked on my repos. I hope you find something else that works for you. @batmaci you better check yourself before you wreck yourself. Stop being a douche nozzle. Watch this then come back and say sorry. @AllanRitchie i have commented your repo last time in Jan 2017 because i dont see any value of reporting an issue or giving a comment on any of your repos. I value your work and appreciate it but not your behavior to the others. It doesn't also upset me that you blocked me. but just because of liked comment, this is just ridiculous. Yes i know what is open source but your repos are like private sources. you dont let others to openly discuss about things. if you dont like something or you think that it takes time, you simply reject it, delete it, block it. why other OS owners are not doing like you? You should judge yourself before you think that there are "people like me". I am actively answering issues on ffimageloading,rg popups, freshmvvm etc. because i feel that i owe those libraries and i want to contribute also. thats how i started with your libraries and most of others did but you just take people down with your ego answers. Open source is never doing things for free. directly or indirectly there is always benefits for the owner. Nobody does something for free if it wont benefit him. 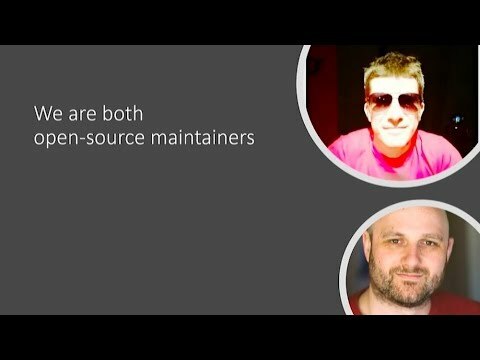 @Alfonsi i am not frustrated at all if OSS maintainer doesn't help me or answer my question. I totally understand it that people have other real jobs and this is just side activity or work. my frustration is that i spend hours, sometimes days to reproduce an issue and i create with full information, sometimes code even a repro or i give a comment on somebody's issues, suddenly i get a one word answer with close or my comment is deleted without discussing further. how should i feel about it. I can totally understand if there are so many open issues shows a project not looking good for the first time comers and thats why he closes it. but he even doesn't let the "closed issues" to be commented among other users. He may think that its not bug but let others to comment further and discuss.